It might not be as star-studded as Comic-Con or as fur-covered as CatCon. But FinCon'17, a conference targeted at a self-described "energetic community of money media nerds," did not disappoint. It was a mind-blowing lesson in what’s possible when a diverse group of smart people, cutting edge technology, and a culture of sharing coexist. But what's in it for you non-money media nerds? You’re leaving your financial planner's office, freshly minted plan in hand. Thrilled to finally have your ducks in a row, you’re practically beaming. Read all about how to make that glow last in my new article "How NOT to Rebalance Your Portfolio" on GuideVine.com. Extra credit: When you're done with that, if you'd like to learn more about the endlessly fascinating topic of Behavioral Finance, check out the "Misbehaving with Richard Thaler" episode of my favorite podcast, Hidden Brain. It's the October 23, 2017 show, which features host Shankar Vedantam interviewing the unexpectedly funny and engaging 2017 winner of the Nobel Prize in economics. You want your grandchildren to have the best education money can buy. But you fear sky-high costs could jeopardize that dream -- or your retirement security. Before you step in to help, educate yourself on the pros, cons, and gotchas of your many options for contributing. 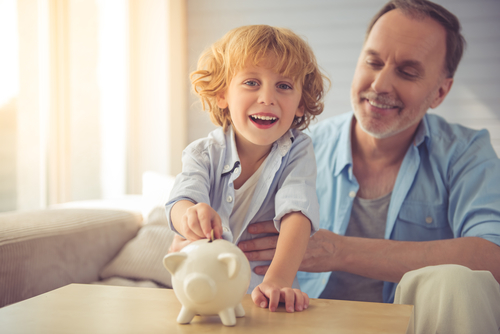 Read all about it in my new article "Education Funding: A Grandparent's Primer to Pay for Education Expenses" on GuideVine.com, a Match.com-like service connecting consumers with financial advisors. Wealth Summit: Enjoy the View! Plan A: Just send it. Use the site's Contact form to submit your topic for a future blog post. Plan B: Take a hike – figuratively, not literally – to the Wealth Summit. Happening September 1 – 8, it’s a free online personal finance conference, so you don’t even need to get off the couch. The reason I’m recommending you attend is three-fold.